Home / Lesson Activities / Wondering What to Do With Apathetic Piano Students? Are You Due For Some Duets? Are you currently feeling the need to reach for your piano teaching bag of tricks? Do you have a student whom you can tell hasn’t practiced in a couple of weeks?… Isn’t paying attention during lessons?… Is not interested in performing in recitals?… Could you be due for some piano duets? Piano duets have the ability to lift anyone’s spirits. After all – two is twice the fun! Grouping your students into same-age, same-level pairings and giving them the opportunity to collaborate on the piano results in nothing but good: They will connect with like-minded peers, perfect their rhythm and coordination, increase their practice time, and find a new level of enjoyment on the piano! For these reasons (and more) duets should be a regular fixture at your piano studio. Piano teachers occasionally shy away from duets. It just seems easier to teach solo lessons. But, throw caution to the wind, check out these hints for avoiding common problems with duets in your studio, and dive in head-first! 1. Create a “duet lesson” for 3 weeks rather than taking over an individual students’ lesson time. You’ll accomplish much more with 2 students when you have a full 30 minutes to work on the duet pairing. Don’t try to steal parts of each student’s lesson for duet practice. This way they can continue with their regular piano lesson material as well as take on the duet. 2. Teach each individual part to the respective students on their own first. The piano lessons where they come together should be lessons where the parts are coordinated, not learned. 3. Test your student’s readiness to play as a duo by filling in on the missing part yourself during their individual lessons. This takes any angst away from the student when it comes time to put it together with their peer. They need to be able to “hear” the other person’s part in their head before they both sit down on the bench. 4. Choose repertoire “down a level” – pair students onto a duet that is one level below where they play as soloists. 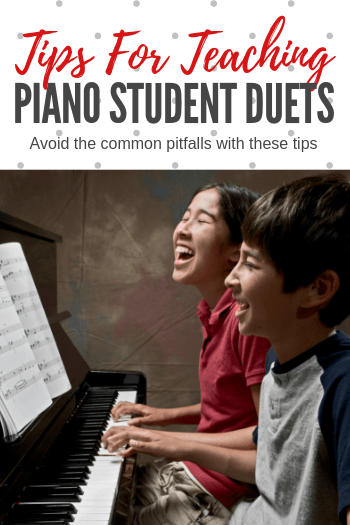 Duets add a whole new level of difficulty and skill and you want this to be a fun experience for your students… not a dread-worthy one! 5. Create an opportunity to showcase the duet when it is ready. Duets are fantastically fun to watch and your students will appreciate the enthusiasm they will get from an audience. Looking For Fun Duets For Beginners? WunderKeys Rock Repertoire for Teen Beginners Books 1 and 2 are filled with 14 motivating duets that are perfect for pairing a beginner with a more advanced player (or yourself!). Packed with pop-flavored music, these books will become a constantly-requested resource in your studio! Find them on Amazon here.